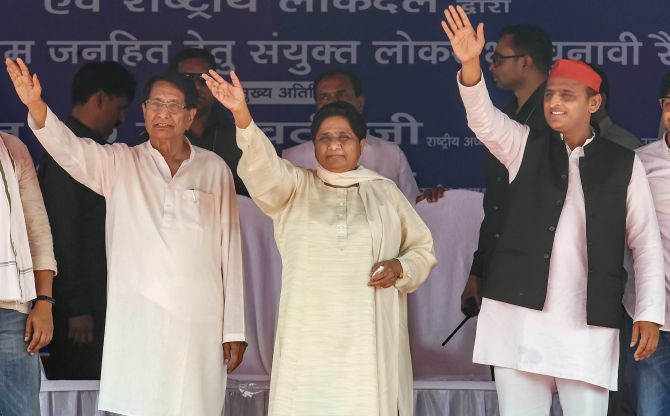 Bahujan Samaj Party supremo Mayawati on Sunday slammed both the Bharatiya Janata Party and the Congress at the first joint rally with the Samajwadi Party and Rashtriya Lok Dal in Deoband, leas than a week before voting in the first phase of Lok Sabha elections. "BJP will lose this election because of policies inspired by hatred.. especially their chowkidar campaign... no matter how much the chhote, bade chowkidars try, the BJP will not win," she said. Addressing the rally in the presence of SP president Akhilesh Yadav and RLD chief Ajit Singh, she said, "The Congress has failed despite ruling for so many years." She said, "We are silent workers, unlike other parties. Our party performs without making noise, we are silent workers. The Congress too has been making tall claims, haven't they been given enough chances for decades? "They were wiped out from several states. The Nyay scheme is not a stable solution for removing poverty." "Even the people from backward communities are suffering... The divisive thought process of these parties are hurting these communities... At the Centre, or state level... reservation issue for these communities was ignored. "These communities are not benefiting from the reservation. They are being exploited. Minorities are also suffering." "The Congress was tainted by bofors. BJP government is tainted by Rafale... The BJP government has been misusing probe agencies -- CBI, ED - against its rivals. "You don't need to give another chance to them. The parties that have already been given enough chances In the election season, political parties use opinion polls to misguide voters. Do not get swayed," she appealed to the voters. 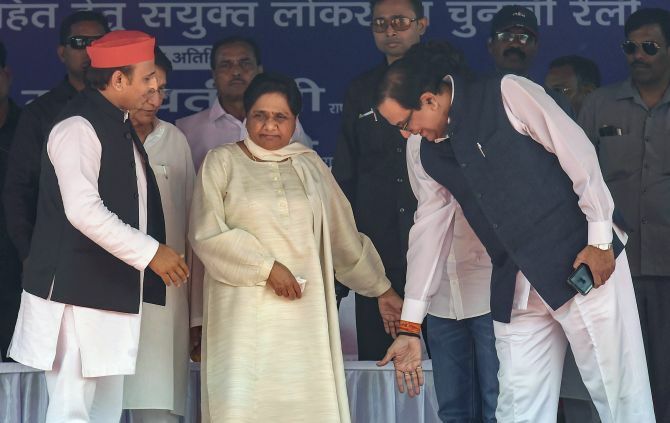 IMAGE: Akhilesh and Mayawati with BSP leader S C Mishra during the rally. "If PM was serious about welfare of poor, they would not have been inaugurating schemes after poll dates were announced... they would have performed in five years of tenure. "In the last budget... whatever announcements were made by centre are nothing but empty poll promises," she said. Accusing the BJP-led National Democratic Alliance government of creating more rifts in the society than the British during colonial rule, SP chief Akhilesh Yadav said this time, the Lok Sabha elections are to bring a 'mahaparivartan (mega change)'. Referring to the 2014 parliamentary election, the SP chief said, "He (Modi) came as a chaiwala (tea-seller) and we all believed (him) for the sake of 'achche din' and crores of jobs. But now, when elections have come again they say they are chowkidar (watchman)." The SP chief stressed that the dreams of socialist thinkers Ram Manohar Lohia and Kanshi Ram will be fulfilled by the alliance. The promise of 'achche din' (good days) has turned out to be 'burey din' (bad days). They (BJP)... brought goods and services tax, which benefitted big businessmen but the small ones remained harassed, he alleged. 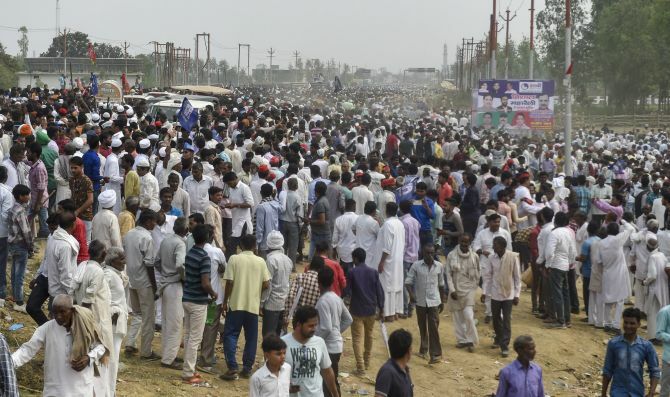 IMAGE: Crowd of supporters during the joint election campaign rally at Deoband. "They created walls within society, when what was required was that progress be made with the help of schemes." Meanwhile, RLD chief Ajit Singh took a swipe at Prime Minister Narendra Modi asking him what he has done in the five years he has been in power. At the joint rally, he said, "What has Prime Minister Modi done in five years? He wasn't talking about your 'achche din', but his own 'achche din'."